His Eminence Archbishop Kyrill presided over the rite together with His Grace Bishop Theodosy of Seattle and His Grace Bishop Nicholai of Manhatten in the company of many clergy both from throughout the Western American Diocese and from other dioceses and jurisdictions, and likewise laity. The candidate to the episcopacy was led out of the holy altar by Abbot Juvenal (Herrin) and Abbot James (Corazza) and bowing before the honorable bishops and standing before the life-creating cross and holy gospel, he read a homily that expressed his view of the exalted work of shepherding Christ’s flock as an archpastor. The nominee spoke of the call to walk in a newness of life. Moreover, that some receive God’s grace to become fishers of men. He spoke of the devotion a bishop must posses as he suffers for, and with, the souls that have been entrusted to him. Father Irenei recalled his parents, and many holy figures and mentors that have assisted his spiritual formation, not the least of whom are Saints glorified by the Holy Church. And, he concluded: “I fervently pray that I may continue to know (Christ) more deeply through the grace with shall come upon me through Your holy hands; that I may always cling to my first love (cf. apoc. 2.4): our Lord and God and Saviour Jesus Christ; and that I may, despite the sins that are ever before my face, worthily draw into His saving embrace those whom the Lord shall entrust unto my care..."
and Divinely-Beloved People of God! On this solemn occasion of Feast of the Holy Icon of the Theotokos, ‘Joy of All Who Sorrow’, which adorns and protects this God-preserved Cathedral in honour of her who is the consolation and help of all Christians, you, as the divinely-wise and holy shepherds of the Church, on behalf of the Holy Sobor of Bishops, have called me forth to the rank of Bishop, to bear upon my shoulders the same Cross which the Lord has wisely placed on yours. It is only by the intercession of our Most Holy Lady that such a Cross can be borne by any man, and so it is in gratitude for her ever-present comfort, and trusting in her guidance, that I proceed with trembling along the path towards this most exalted office. When He walked upon this earth in His divine Incarnation, our Lord and God and Saviour Jesus Christ called forth the poor and the rich, the ignorant and the wise, the weak and the strong, with the consistent calling to Take up your Cross and follow Me (Luke 9.23). He opened the way of salvation unto all, drawing the fallen and the broken into His care and lifting them up into a newness of life in Himself (cf. Romans 6.4; John 5.26). 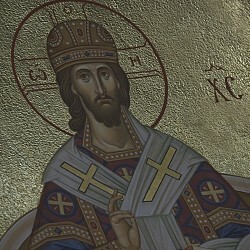 Some of these, despite their own weaknesses and shortcomings, He called forth to a particular mission: by His special grace to become fishers of men (Matthew 4.19), to go into all the world and preach the Gospel to every creature (Mark 16.15), to baptise all nations in the Name of the Father, the Son and the Holy Spirit (cf. Matthew 28.19), and, in emulation of His merciful love, to feed His sheep (cf. John 21.15-17). Since the days of the first Apostles, the Lord’s High Priests (архиереи, bishops) have faithfully nurtured and preserved Christ’s flock in every generation. Their ministry has been characterised by the love of Divine Service and prayer, the celebration of the Holy Eucharist and the other Divine Mysteries, the defence of the Truth in the face of every challenge and aberration, and the constant exhortation to repentance and holiness; but above all in their willingness to follow the Saviour and to lay down their lives for His sake (cf. John 15.13; 13.37). We live today in an era confronted by grievous attacks and wounds that the evil one seeks always to inflict upon us, which lead man to fear, confusion and the loss of hope. But the Body of Christ, His holy and spotless Church, suffers no worldly wounds, and her children will not be broken or driven from His grace so long as their hearts remain pledged to the purity of His word. The True Light will always overcome the darkness, love shall always cast out fear, and those who preach hope in the Lord preach a Way, a Truth and a Life that no power can overcome (cf. John 14.6). The Bishop, as we have been taught by our Fathers and as we have seen in so many living, holy examples, is called to be an authentic shepherd to his flock: to his clergy, his faithful, and the whole world. He must stand with his sheep in times of peace but also of turmoil, must suffer with and for them, must offer his soul to teach and protect them, must sacrifice all his energy and even his very life on their behalf, knowing that they are not his own sheep but the Lord’s, and that one day he will give an answer for their souls — and he must do all this with joy, with limitless patience and love, through the grace bestowed on him, knowing the voice of each lamb, and being known by them as their own (cf. John 10.3, 4). Of none of these most high callings do I feel myself worthy, knowing my many weaknesses, but to all of them I pledge the fulness of my heart, the struggles of my soul, and the remainder of my days. I fall down upon the support and sustenance offered to me by Your Eminences and Your Graces and plead for your ceaseless intercession and the pastoral care of you and your brother Hierarchs. I offer heartfelt gratitude to His Holiness the Patriarch, to His Eminence Metropolitan Hilarion, First Hierarch of the Russian Church Abroad and beloved pastor of our flock in the diaspora, and to all the members of the Holy Sobor of Bishops for the confidence and trust you are laying upon me today. 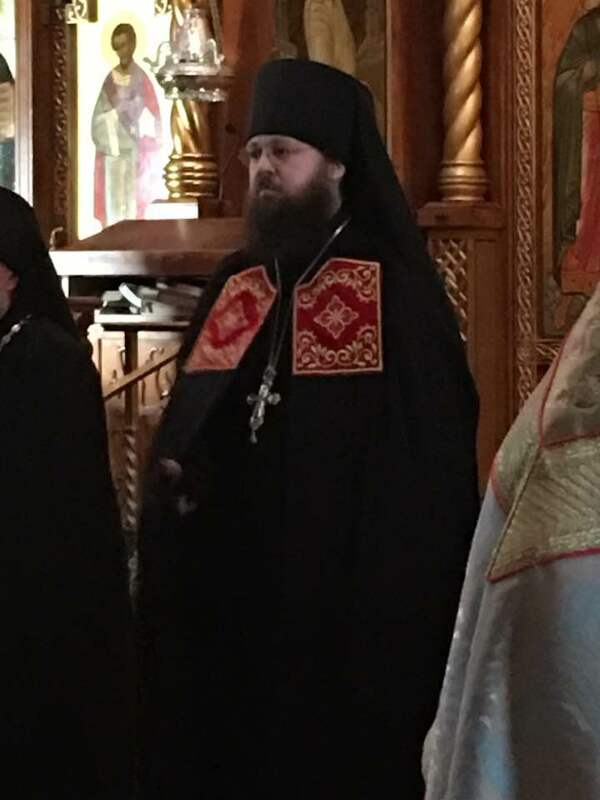 Especially I am grateful for the prayers and confidence of our Archpastor in this God-preserved Diocese, His Eminence Archbishop Kyrill of San Francisco and Western America, and to my spiritual father and elder co-struggler in monasticism, His Grace Bishop Theodosy of Seattle. I offer my gratitude to God for the grace and love shown to me by so many brother clergy and monastics throughout my life, both in this land and abroad; to the beloved parishioners of St Tikhon’s orphanage Church, by whose prayers and love I have been sustained day by day; and to the multitude of parishioners, spiritual children and students across the world whose lives have uplifted my own. 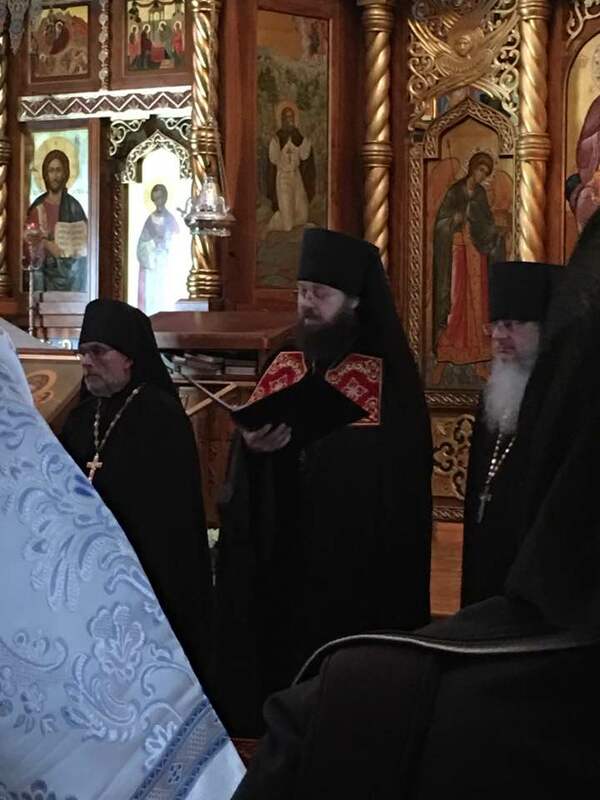 I offer my gratitude to His Eminence Metropolitan Kallistos of Diokleia, and with particular love and tenderness I call to mind the Elder Aimillianos of the Holy Mountain of Athos, who, through his spiritual children, so powerfully opened unto me the beauty of the true theology of the Church of Christ. Knowing the depth of insufficiency that separates me from the truly holy hierarchs of our living memory, I call upon the aid of all those who have faithfully upheld the traditions of the Russian Orthodox Church Outside of Russia and handed to us, incorrupt, the great Pearl of salvation: the ever-memorable Metropolitans Anthony, Anastasii, Philaret, Vitaly and Lavra, Archbishop Tikhon of San Francisco, and many others whose legacy has left an imprint on my soul and set an example before my eyes. Likewise, the God-inspired hierarchy of the whole plenitude of the Russian Church: especially the ever-memorable Patriarch Alexei II of Moscow and All Russia and the ever-memorable Metropolitan Anthony of Sourozh, by whose instruction I was first urged towards the clerical life. 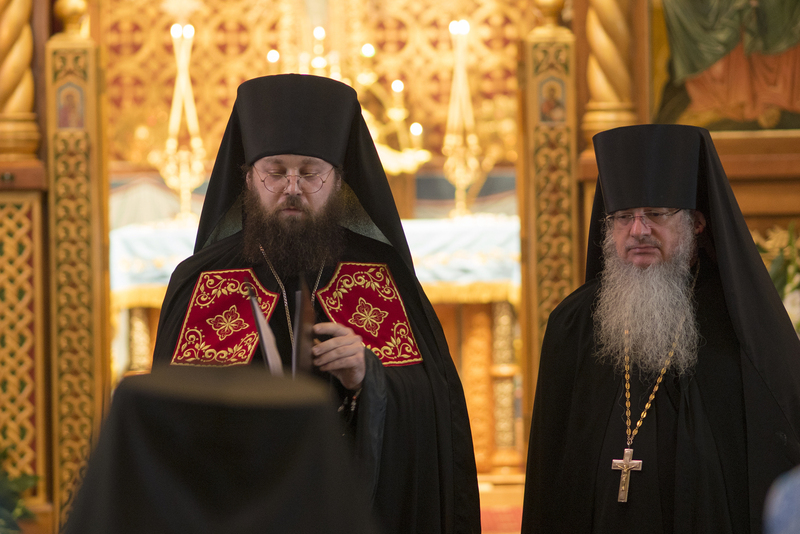 These true Pastors of both homeland and diaspora have inspired in me the deepest love of our Russian Orthodox Church, of the Russian People who have received me like an adopted son, and of the sacred culture preserved through times of extraordinary trial as a gift to every people, culture and tongue — even to the whole world, which so desperately needs it now. I wish also to give thanks to our Lord for my beloved parents, who from my youth have nurtured in me a fervour of faith and have, and continue to be, examples of self-sacrifice and love; who have made it a joy to keep that great commandment to honour thy father and thy mother (Exodus 20.12). May the Lord God reward, protect, bless and save them. Your Eminences and Your Graces: on this day, perhaps more than any other in my life, I am mindful of the ever-present intercession of the great host of Saints who day by day intercede for and bless us. I pray that those dearest to my soul — the Holy Equal-of-the-Apostles, St Mary Magdalene, who since my youth has been an unfailing guide, urging me to follow Christ; the Holy Apostle and Evangelist St Matthew; our beloved Hierarch St John the Wonderworker; and a host of others — might embrace and guide me in this new calling. Above all, I seek the intercession and blessing of my heavenly patron, the Holy Hierarch and Hieromartyr St Irenaeus of Lyons. By God’s inscrutable mercy, You, Vladyka Kyrill, gave me this Saint’s name at my monastic tonsure — a name which means ‘Peacemaker’ and is itself a perpetual calling. I have dedicated my life to striving for obedience to the Holy Fathers and I have learned from each of them; but from none have I learned more than from St Irenaeus, who mightily defended the True Faith and stood, like the Holy Apostle St Peter, as a rock of sure confession; and who taught the world, and me, to love the One Whom he so eloquently called ‘the Lord God of Abraham, and God of Isaac, and God of Jacob and Israel … the Father of our Lord Jesus Christ: God, Who, through the abundance of Thy mercy, has had favour towards us, that we may all come to know Thee’ (Against Heresies, 3.7.4). I fervently pray that I may continue to know Him more deeply through the grace which shall come upon me through Your holy hands; that I may always cling to my first love (cf. Apoc. 2.4): our Lord and God and Saviour Jesus Christ; and that I may, despite the sins that are ever before my face, worthily draw into His saving embrace those whom the Lord shall entrust unto my care. May the Holy Trinity, our Pre-Eternal God, in this sacred moment of election make His grace replete in me and in all of us, and sanctify His Holy Church unto the ages of ages. Amen.